Xc 45 (Build No84) - VERKOCHT! This yacht is new, it arrived in April 2015 in Singapore. Transported by a large cargo ship. 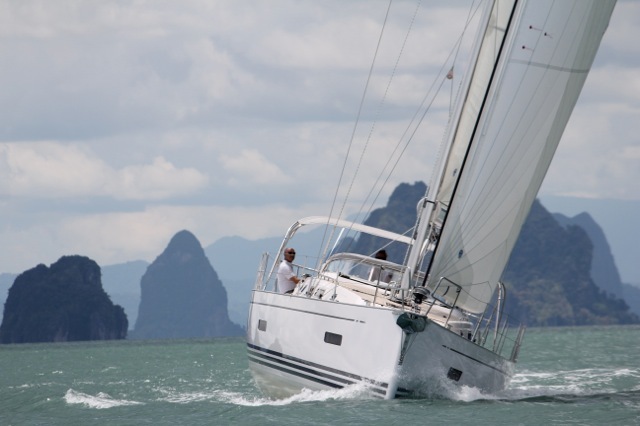 It was used as demo at the Singapore Yacht Show and then sailed to the Ao Po Grand Marina in Phuket. The yacht is equipped for single hand and easy sailing. It is equipped with a furling boom and furling headsail which both can be handled with an electrical winch from the cockpit. Xen has an extreme high ballast ratio which assures safe, stiff and well balanced sailing under all conditions. The yacht is built category A “Ocean”, additionally the hull construction meets the high requirements of American Bureau of Shipping. The loads of this high ballast can only be taken by the steel frame, which is integrated in the hull of the yacht. It takes all the loads of the mast, rigging and keel. The hull is built in composite with vinylester in the outer skin layers, foam core with biaxial E-glass skins and local uni-directional reinforcements. Solid laminate is used around the keel structure, rudder stock bearing, each hull fitting, saildrive and bow thruster. At the forward end of the yacht is a watertight bulkhead, separating the interior for safety in the event of a collision. The integrated steel keel structure has a single hoisting point. The keel has a cast iron fin and antimony hardened lead L-bulb. It is encapsulated in three layers of GRP and faired to the original keel section templates. The hull has a five year X-Yachts warranty against osmosis. The yacht and all equipment have a two year full X-Yachts warranty. Full teak decks and cockpit. Special cover for the complete deck of the yacht. 6 oversized Andersen winches (one electrical), two for German mainsheeting of the mainsail from the steering wheels. All winches can be upgraded easy to electrical. Teak bracket for outboard engine. Cockpit table with integrated 125 inch Raymarine touch screen chart plotter. Three air conditioning units: one for the saloon, one for the owner’s front cabin and one for the two aft cabins. 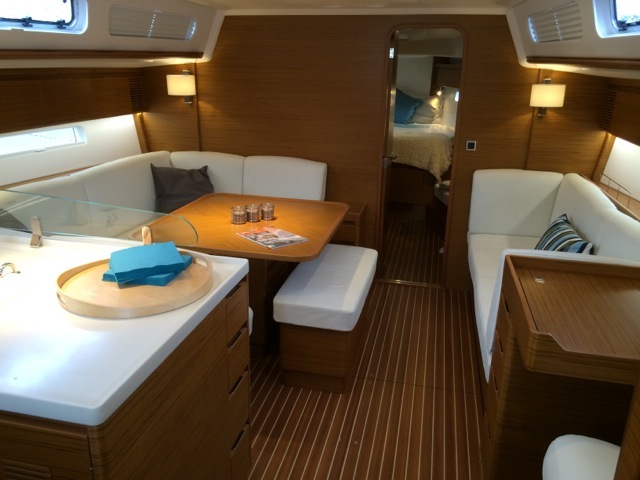 Classic interior in teak with two aft cabins, two heads with showers. Owner’s cabin in the front with heads and separate shower compartment. Saloon in light beige leather. Spring mattress in owner’s cabin. Cabins in light grey material, Brooks 115 silver grey. Two fridges, one vertical, water cooled. Supplied with a nice set of cushions and a complete set of bed materials. Also full set of cutlery, glasses, plates, pots and pans. Teak floors in both heads and shower compartment. Teak/holy striped floors in the saloon and all cabins. Electrical toilet, Quiet flush, large size bowl at owner’s heads. Jabsco toilet manual toilet in aft heads, large size bowl. Raymarine 2 x A75 displays at garage. Raymarine A125 chart plotter with touch screen, detailed charts of South East Asia. Raymarine EV 400 with p70 display. Raymarine 260E VHF with station at steering wheels. Blaupunkt Multimedia Center CD/DVD/MP3/USB incl. 2 loudspeakers in the saloon and two waterproof Bose 131 in the cockpit. 50 amp/hr battery charger instead of standard. Furling fully battened mainsail in the boom in spectra, with boom cover. Furling jib in spectra with vertical battens. Genaker equipment (but no genaker). Bottom treatment, 3 x epoxy and 2 x antifouling. A-frame (bowsprit) in Stainless Steel and teak with tack eye for the genaker. Grab rail in S/S at the end of the cockpit table. Crash bars at wheel pedestals. Cockpit cushions in grey canvas. Windscreen with glass and aluminium. Covers in grey for cockpit table, steering wheels. Dinghy Highfield Roll-Up 250 Airmat, new. Suzuki 2,5 Hp outboard engine, new. Galvanic isolator to prevent corrosion. Gear/gas throttle for engine at wheel crash bar. Polyester strap and high load shackle for center hoist point. Webdesign & hosting by GuCro v.o.f.